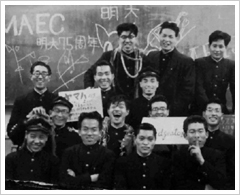 Out of thirty-two of my high school classmates, thirty took the entrance exams for universities, and only I was going to go to work. It had been decided before the war that I would take over my fathers rice business. But seeing what was happening around me, I began to wonder if I was ready to go straight to work, and lost interest. Only I would be split off from my friends, but finally in my senior year, I pleaded with my father to let me take the university exam even though I wasnt that fond of studying. He said, "All right. You may have to be a ronin (a person who fails the exam and then takes the exam again the following year). Go ahead and try, but what department do you want to go into?" I was troubled because I didnt know much about it. "What department would be good? Father, please think of something..." He rubbed his eyes, and after a long silence, he raised his arm and pointed to the ceiling. "This is an electronics age. Try the electronics department!" It was a flash of inspiration from my father. Thereafter, I set into studying in earnest for the exams. Unlike my brother who studied applied science, I wasnt overjoyed to take up this field. Nonetheless, the universities I was shooting for were Meiji and Nihon, and took their exams. I went to check the results, but I didnt see my name or test number. "I guess its the rice shop," I remember thinking to myself as I returned to Kudanshita depressed. One week after I had resigned myself to taking on the rice shop, letters from both schools arrived saying that I had been included on the substitute list. Why did I pass? It wasnt because I was self-confident but at that time, only 20% of high school students went on to university. The level of my high school and other schools in the Tokyo area were quite high compared to the national average, so it seems I was accepted because of this. I entered Meiji University, which was cheaper. My high school was in Akihabara and had taken me thirty minutes on foot to get there but Meiji was closer only taking me fifteen minutes. I remember that there were many exams in the science courses, which were hard. (Anyway, the electronics age arrived, just as my father had predicted - hats off to him!) But most importantly, when I became a university student, I also began my Aikido practice.